No matter what you do, it seems the holidays are always busy. And the gift-giving can cause some financial tension. To make your holidays less stressful and help you save some money, we have put together a 10 tips to an energy efficient holiday season. 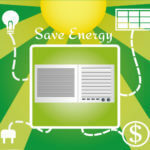 If you are purchasing electronics or appliances this holiday season, consider energy efficiency. Look for the ENERGY STAR label, which lets you know the product has met or exceeded strict energy efficiency guidelines. If you’re purchasing new holiday lights, spend the few extra dollars and get the energy efficient LED’s. The purchase will pay off with a much smaller energy bill. LED holiday lights are up to 6 times more energy efficient. Leaving your holiday lights on all day is a great way to waste your money. Invest in a few light timers for your home and you will never again have to worry about forgetting to turn of the lights. You can cut your heating bill in the winter by dressing a little warmer, using extra blankets at night and turning up your thermostat. Even a few degrees can make a difference in your energy bill. A dirty air filter reduces your heating system’s energy efficiency. Replacing or washing your air filter is one of the easiest ways to decrease your furnace’s energy use. The holidays usually mean lots of cooking, which brings with it lots of cleaning. For maximum energy efficiency, keep your oven and refrigerator doors closed as much as possible. And only run your dishwasher when it is full. The air ducts in your home are usually taken for granted. However, they play a large role in the comfort and energy efficiency of your home. If your home has one of these air duct problems, fixing it could greatly increase your energy efficiency this holiday season. If you are purchasing a new artificial tree, consider a pre-lit fiber optic one. These trees are lit using only one light bulb and are much more energy efficient that lighting a tree with strings of lights. 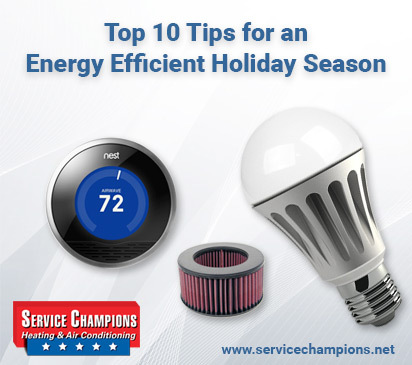 From our families to yours, Service Champions wishes you a safe, happy and energy efficient holiday season! Service Champions is Northern California’s premier heating, cooling and air quality company, serving the East Bay, San Jose, Sacramento and Tri-Valley areas. Contact us for information on any of our products or services. 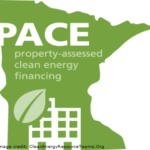 What is the PACE Program and Why Should You Look Into It?